REETS project is intended to support the existing European Union’s legislation on the interoperability of electronic road tolls’ collection and, in this framework, the project aims at deploying EETS compliant services in a cross-border regional area, including the following seven Member States: Austria, Denmark, France, Germany, Italy, Poland and Spain, as well as Switzerland (the latter without EU co-financing). Finding risk management rules mutually acceptable by the parties. a monitoring phase, with the implementation of an open information platform on the gained experience, accompanied with the monitoring and the coordination of pilot demonstrations related to EETS compliant services covering several participating Member States. The project consortium is composed by the major Toll Chargers and Toll Charger Associations of the above mentioned Member States, as well as by the future potential EETS providers represented by the Association of European Toll and Interoperable Services AETIS. 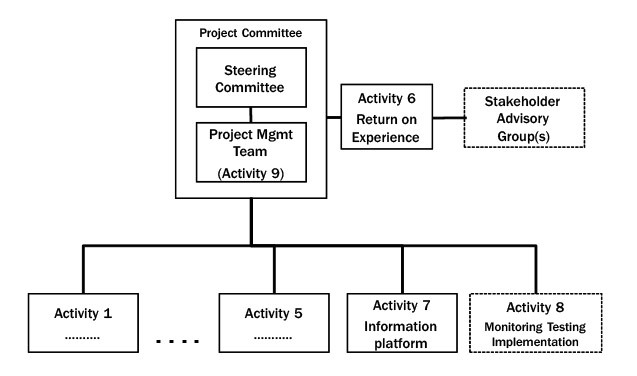 The project is run by the Project Leader (Mr. Hubert Resch from ASFINAG, Austria), who chairs the Project Management Team together with Mr. Dionelis, Secretary-General of ASECAP; all the decisions are taken by a REETS Steering Committee, chaired by the ASECAP President, in which high level representatives from each project partner are present.